In her senior year of high school, Julia Theobald received some advice that most young adults have never heard. Julia was told there was an option other than college or the military after high school. In fact, her stepfather advised her to not even bother with college. “I thought, why would I go into debt when I didn’t even have a plan for what I wanted to study in college or where I wanted to be afterwards,” says Theobald. To say that this line of thinking came as a shock to her friends is an understatement. As her friends and classmates at Zimmerman High School were applying to colleges or the military, Theobald’s news took them by surprise, in particular because she was an honor roll student and even a math tutor. “Everyone around me just expected that I would to go the traditional route and get a college degree,” she says. 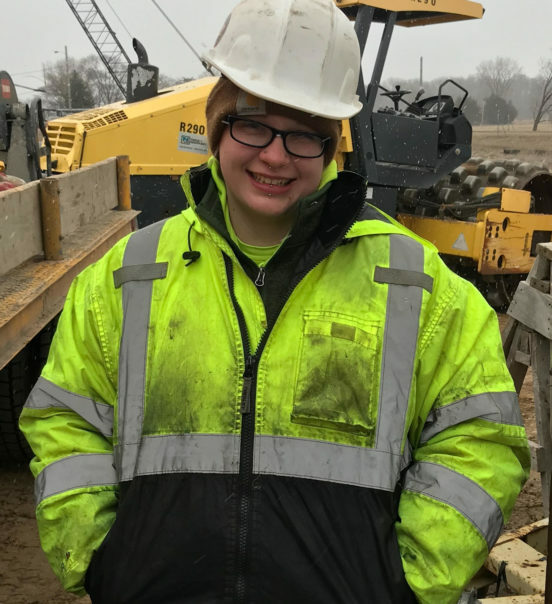 The possibility of a 21-year-old buying their first home might seem outrageous to the majority of college juniors and seniors her age, but not for someone like Theobald, who has been learning and earning for two years through the International Union of Operating Engineers (IUOE), Local 49, as a heavy equipment operator apprentice. 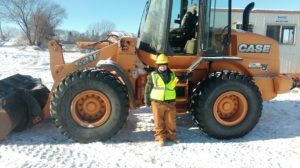 Before starting at the Local 49, Theobald, a resident of Zimmerman, Minn., started as a pre-apprentice, dedicating her time to gaining the training she needed at Summit Academy, located in Minneapolis, right off of Olson Highway. At Summit Academy, Theobald participated in two 10-week long pre-apprenticeship programs for carpentry and heavy equipment. After 20 weeks of class, it was time to take the aptitude test, along with 100 other people hoping to ace it and have a chance of getting into the Local 49 apprenticeship program. Julia was one of ten people chosen to take part in the five-week pre-apprenticeship training that would prepare her for getting a job in the union. Once this was completed, Theobald was on the job hunt, looking to get hired by a union contractor and be on her way to starting the apprenticeship program with the Local 49. “It’s hard work. I think some people don’t understand the knowledge and expertise that is needed to do what we do,” says Theobald. The pay is great, but what’s even more exciting, there’s a ton of benefits to working in the union – good pension, great healthcare, ongoing training, and the option to invest in a 401k. At the Local 49, apprentices are getting top training at a state-of-the-art facility in Hinckley, Minn., that has the ability to produce the best, most professional Operating Engineers in the industry. Once starting at the Local 49, apprentices get to earn while they learn, and begin building an unbeatable health (medical and dental) package and pension plan. During her training, Theobald came to realize the value placed on safety at a construction site. In construction work, safety is imperative, and when working for the Local 49 it’s not something that is taken lightly. The Local 49 boasts a remarkable commitment to teaching safety and protecting all members, especially apprentices that are just learning how to operate the equipment. Before getting into the Local 49, Theobald had to get a job with a union contractor. 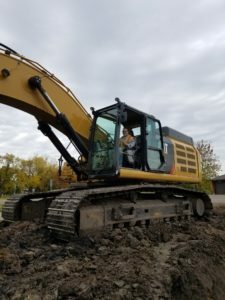 She was ultimately hired by Shafer Contracting, based in Shafer, Minn., an award-winning construction team that specializes in earthwork, underground utilities, concrete paving, curb and gutter, and traffic control. Theobald didn’t realize how successful she could be in this line of work, especially because no one talked about it. None of her teachers ever mentioned construction as a career option. All of the messages she received, primarily because Theobald was a good student, were focused on college. “I’m going to have a ton of money saved up since I started so early, and then I’ll be able to retire when I’m 55,” Theobald says. Regarding her career, Theobald knows she’s part of a minority as a woman, but that’s not stopping her. To learn more about construction apprenticeship opportunities, visit ConstuctionCareers.org. To learn more about the International Union of Operating Engineers (IUOE) Local 49, visit Local49.org.